Many people are surprised when they see that a typical British trolleybus has a power pedal operated by the left foot and the brake pedal in the normal position operated by the right foot. Why are the controls like that when the motorbus has its controls in the same place as on a car? If we were to design a modern trolleybus, then the result would be like an automatic bus or car. In fact, just like the Dennis Dominator trolleybus built in 1984. Traditional trolleybuses were designed based on the alternatives of the time - the trams. To see why things are as they are, we have to start with horse trams. Horse trams were very simple. The only control needed was a brake and that was operated by the driver's right hand. It had to be the hand, as the driver stood and it was the right hand, because most people are right-handed and a fair bit of strength is required to operate the brake. Left-handed people will know too well that virtually everything is designed with right-handed people in mind. The photograph is of a horse tram from the Wolverhampton Tramways Company. This car ran from Queen Square to Newbridge. It can be seen at the Black Country Living Museum in Dudley. Unfortunately it can't run as the tram is of standard gauge, while the track is narrow gauge. Also as horse trams only had a top speed of 4 miles per hour, the flanges on the wheels are very shallow and the track was of quite a diffrent profile to the track needed for the higher speed of electric trams. When the first electric trams were built, they were usually the same design as the horse trams, but with an electric motor in the truck. Some horse trams did get converted to electric operation (an example from Portsmouth survives). As drivers were well familiar with the handbrake operation on horse trams, the same configuration carried over to the electric cars. The controller was therefore on the left side, so the driver could operate the brake and power controls separately. Drivers of electric trams were recruited from the ranks of existing drivers of the horse trams. Also the companies designing the horse trams were the same ones building the new electric cars. The photograph is of a Portsmouth tram. Originally a horse tram, built around 1875, it was converted to electric traction around 25 years later. This tramcar can be seen at "Milestones" in Basingstoke. Unfortunately, it is a non-runner and is a static display item only. Once tramways were electrified, they spread fairly rapidly. This provided cheap mass transport, but by the end of the Edwardian era, there were very few routes left that would allow for the expense of track laying. What was wanted was a tram which didn't need tracks. Thus the development of the trolleybus came from the idea of a "trackless" tram and not from an electified bus. The photograph is of one of the two "Tividale" trams located at the Black Country Living Museum. They were built around 1920. At this time, the track was in such poor repair, after the shortages of the Great War, that the Board of Trade refused permission to run double deck cars. These were built in huge quantities for the various Black Country tramway companies. 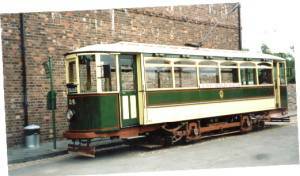 No 34 (pictured) was built for the Wolverhampton District Electric Tramways and ended up owned by the corporation. Like all of the "Tividale" cars it had a very short life and the two cars have been in service at the museum, much longer than they were during their working lives. 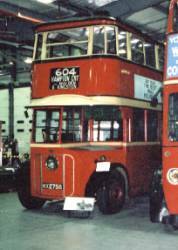 The very first trolleybuses were virtually tramcar bodies on a bus chassis. Many of the early ones had hand-operated controllers and those that didn't have a ratchet arrangement to operate the controller by the left foot. The tram layout of controller on the left, brake on the right was retained, because in legal terms, trolleybuses were trackless trams and not buses. Trolleybus drivers came from the ranks of tramcar drivers and they were familiar with that layout. As the 1930's saw the trolleybus turn from a trackless tram into an electric bus, the controls stayed where they were. As the new vehicles came into service, drivers, who had learned on the older vehicles, were driving them. Fleets where there were both buses and trolleybuses would separate the operation. Trolleybus drivers and conductors would only work on the trolleybuses. Thus there was never any incentive to change the cab layout. The photograph is of one of London's "Diddlers". 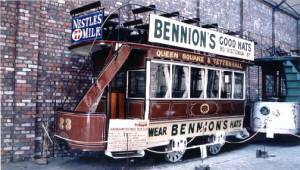 This bus was built for the London United Tramways company and bears a distinct resemblance to the "Feltham" tramcars. 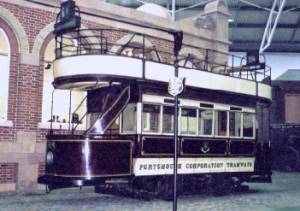 They were both based on "Poppy", which was a tram built by LGOC (London General Omnibus Company). At this time, the LUT, LGOC and MET (Metropolitan Electric Tramways) were all companies in the group known as the "Combine". When London Transport took over in 1933 it expanded the original London fleet to rapidly overtake Wolverhampton (until then, Wolverhampton had the largest trolleybus fleet in the world). What about the future? Should trolleybuses return to the streets (which despite a good campaign, is now looking very doubtful), drivers would be recruited from the ranks of PCV licence holders. These would have very similar layouts to automatic motorbuses.